Photo : Main: George and Jeanie Sodder in front of the billboard. At about midnight on Christmas Eve, 1945 in Fayette, West Virginia, Jeanie Sodder was awakened by her phone ringing. On answering it a woman asked for a man whose name Jeanie did not recognise. The woman at the other end let out a weird laugh and then hung up. Jeanie then noticed that there were lights still on in the house. She had gone to bed soon after her husband that night. She told the youngest of her nine children to do the same, but they had pleaded to be allowed to stay up late to play with their toys. Jeanie gave in, but told them to make sure all the lights were off and that the house was locked before turning in. This apparently, had not been done. Jeanie returned to bed, but was soon re-awoken by what sounded like a rubber ball being bounced either on or in the roof. Soon after this, as Jeanie attempted to drift off to sleep, she noticed her room filling with smoke. The house was on fire. Jeanie called for her husband and children to get up and get outside. This was quickly followed by a flurry of movement as the Sodder’s left the house... but five of the children were unaccounted for, the ones who asked to stay up late that night. The Sodder men (George Sodder and his two eldest sons) attempted to re-enter the house, but the lower floor was completely ablaze. George quickly ran to the side of the house to grab his ladder, intending on entering the building at the second level – but it was not there, the ladder was missing. Several other attempts were made by the Sodder’s to enter their burning house, but all failed. One of the girl’s ran to the neighbors to call the fire department, but they would not arrive until morning was well and truly set in. As it turned out there was no real work for the fire department, as within 45 minutes the entire house had burned to the ground, the remains piling into the basement. Maurice (14), Martha (12), Louis (10), Jennie (8) and Betty Sodder (6) did not survive the fire... or so it was claimed. The investigation did not last long. Investigators claimed the fire had begun as the result of an electrical fault, however many claim that if this was the case, why had people seen the Christmas tree lights still illuminated during the fire? Several fragments of bones and pieces of internal organs were found in the ruin. However the fire was fast and should not have been able to completely obliterate the remains of the five Sodder children. Analysis revealed that the 'human organs' were in fact beef liver. Still the coroners called it case closed, the children had died in the fire, a fire which was accidental, and the investigation was finalised. George Sodder piled soil over the houses remains, and that was that. But there were still some lingering questions that nagged at the Sodder’s, and the rest of the community. For several days leading up to fire the children had reported seeing a stranger watching them from a parked car. A man was seen going through the Sodder’s garage during the fire itself – he was also fined for cutting the Sodder’s phone lines. The missing ladder was also located, seemingly tossed down the side of an embankment. Finally some witnesses stated what looked like 'fireballs' being hurled at the Sodder house shortly before the blaze. 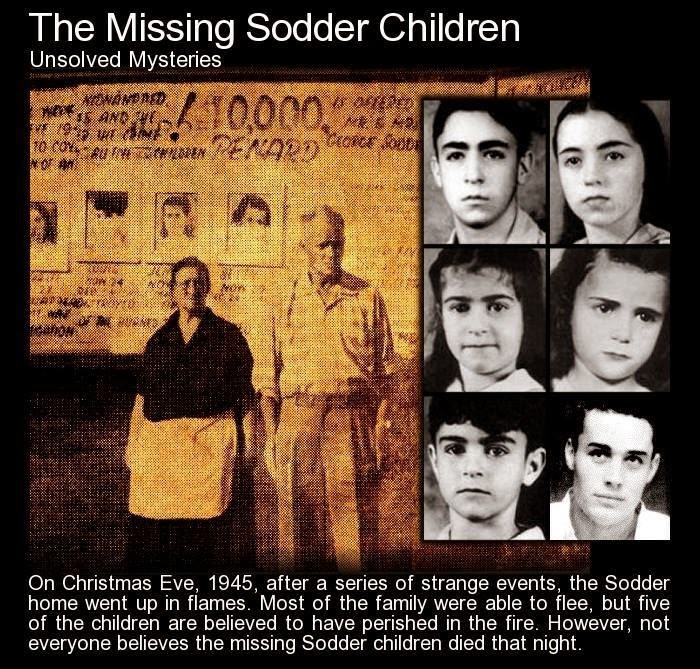 With such reports it is little wonder the cause of fire being due to faulty wiring was not taken too seriously, and soon another possibility began to emerge – the Sodder children had been abducted and the fire was to cover it up. (Note some versions have it that the bones were the first things found in the investigation and that it was the beef liver that was discovered in the box later).This, as you can imagine, fuelled further questions. There was now literally no proof that the children had died in the fire. Six years after the fire, George and Jeanie Sodder erected a billboard at the site of their former home. 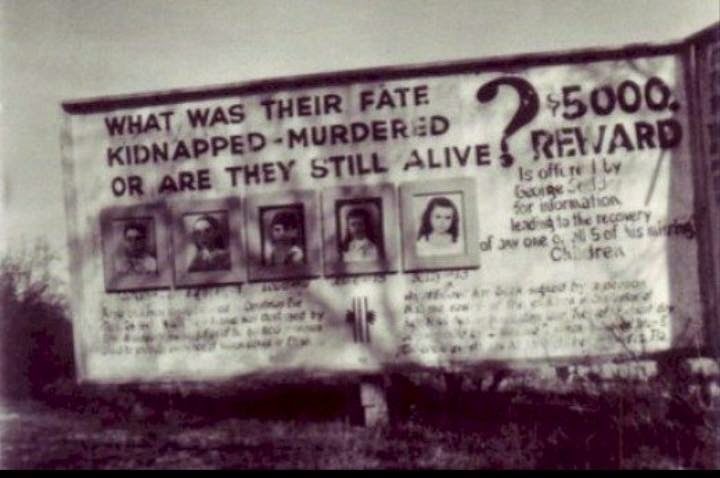 The billboard contained photographs of their missing children, a summation of the events, and a $5000 reward (a lot of money in the early 1950s). Letters came saying that one of the girls was in a convent in St. Louis. Someone even claimed the children were in Florida with a distant relative. The reward increased over time. In 1968 there was one other baffling piece to this puzzle. The Sodder’s received a letter shortly after a detective magazine ran a piece on the mystery. The letter was from Kentucky and contained a photo of a man and written on the back were the words: “Louis Sodder. I love brother Frankie. Ilil Boys. A90132 or 35”. The Sodder's hired a private detective to look into this new lead but after he set out for Kentucky he vanished and was never seen or heard from again. 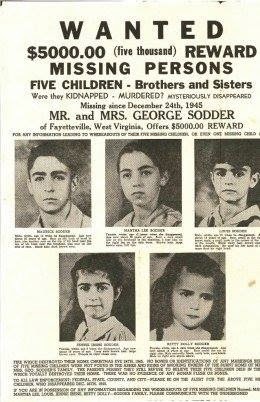 What happened to the Sodder children... we will likely never know, but there are some very interesting questions that need to be answered. Who was the mysterious man reported to be watching the children in the days before the fire? Why did the police only fine a man who cut phone lines at a house fire... why not question him further? Why was the ladder not found where George Sodder usually left it? Where did the bones of an adult male come from and why did one of the original investigators get their analysis so wrong? Finally, what of the photograph delivered to the Sodder’s in 1968 and the missing investigator? George Sodder passed away in 1969 and Jeanie following him in 1989. One other piece to note. Several months before the fire a insurance salesman tried selling home insurance to the Sodder Family. When George declined the deal the salesman was irate and told the Sodders that their house would burn down and their children would be gone. This same man was on the coroners jury who came to the conclusion the house fire was accidental...It is quite possible that the Sodder children did die in the house that Christmas Eve, that when the house collapsed, they incinerated in the 8 hours it took for investigators to arrive at the scene. But even so, there are still many questions about the fire itself and the lacklustre investigation. Inset: The Sodder Children - Maurice (14), Martha (12), Jennie (8) and Betty Sodder (6), the bottom two photos show Louis Sodder (10) and the 1968 photo believed to be of him.